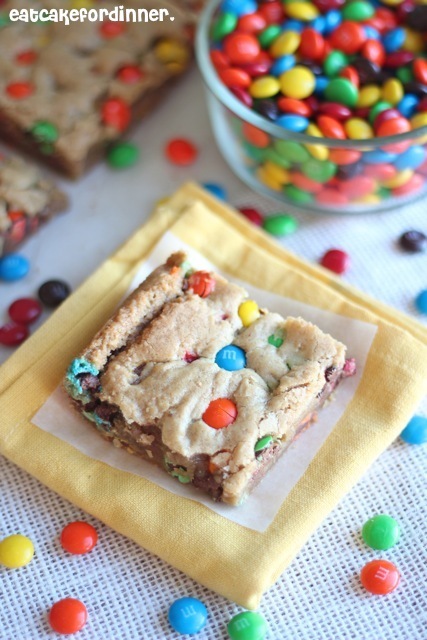 Browned butter mixed in a blondie primarily made with brown sugar and loaded with M&M's. Does that sound like the most rich and divine blondie ever? Well it is sooooooooo GOOOOOOOOD! I thought these were fabulous. They do get pretty dry within a day or two, so try and eat them up as quickly as possible! Since it only makes an 8x8-inch pan, that shouldn't be a problem. Preheat oven to 350 degrees. Line an 8x8-inch baking dish with parchment paper and spray with cooking spray. Melt butter in a small saucepan over medium heat. Allow it to boil, stirring occasionally, until browned. It will begin to smell nutty and it will get foamy when it is ready. It goes from yellow to brown very quickly, so watch closely. Allow to cool for 5 minutes or so. In a medium bowl, mix together the browned butter, brown sugar and white sugar. Add the egg and vanilla and mix well. Add the flour, baking powder and salt and mix until combined. Stir in 1 cup of M&M's. Press evenly into prepared baking pan and sprinkle the remaining 1/4 cup of M&M's over the top. Bake for 30 minutes. Cool completely before serving. Jenn's Notes: The original recipe suggested baking for 25 minutes, but mine were so jiggly and underdone, that I baked them 5 minutes longer. I cut into them while they were still warm and they were still runny and gooey and I thought they were underdone, but once they cooled completely, they were great. We are huge M&M fans here so this recipe will be a big hit. I love the browned butter part of it...yum! Ok, here's my official report...YUM! Thanks for another keeper, Jenn! I am so glad you liked it! Thanks for letting me know. You had me at browned butter! OMG! And M&Ms? Perfect! First, I love your blog name! Every time I have baked with m&ms they crack and don't look very pretty, do you have a secret for keeping them from cracking? your cookies look and sound divine! Hi Jenna, now that you mention it, mine always crack on top too. I never thought too much about it, but I just looked it up on the internet and it sounds like once they get baked for a certain amount of time and reach a certain temperature is when they crack. I found a few recipes for cookies where they suggest waiting until right when the cookies come out of the oven and then pressing the M&M's right on top, so they will still look pretty. We are huge M&M fans in our house. I plan on making so many desserts for my son's birthday party in August with m&m. They make planning a superhero party so much easier! I think I'll be making these with the so many other fun ideas! Those bars are so pretty! My name is Katie and I host Inspired Weekends, open from Thursday to Thursday. I would love to have you link up! O-M-Yum!! This looks like the kind of dough I would have to taste test prior to baking.....Hi, my name is Kim (hi kim), and I have a cookie dough addiction......I can quit ANYTIME!!! Pinning and stopping by from Mop It Up Monday - have a great week!! A test taste is always a must! This does sound like the best thing ever! I love browned butter treats, and baking this with brown sugar must give it a lovely caramel-butterscotch flavor. Yum! Browned butter makes everything better, huh? I'm wild about anything with browned butter. What a great recipe. With only two of us, I do love 'small sized' treats. So glad you shared at Weekend Potluck. 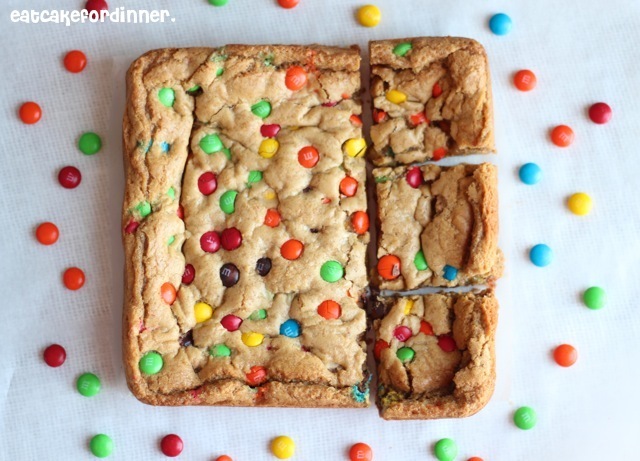 I love blondies and make tons of versions, browned butter, plain, PB & J, you name it. But I've never done M&Ms. Fun idea! Found you on Nikki's linky party. And you are right about blondies seeming un-done at baking time; but they tend to firm up dramatically as they cool. Averie - I love your blog - and I am so happy you commented on my blog. You have got to try M&M's next!! 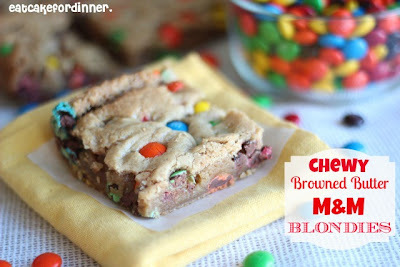 You had me at browned butter and M&M's...two of my favorites in a glorious blondie!! !